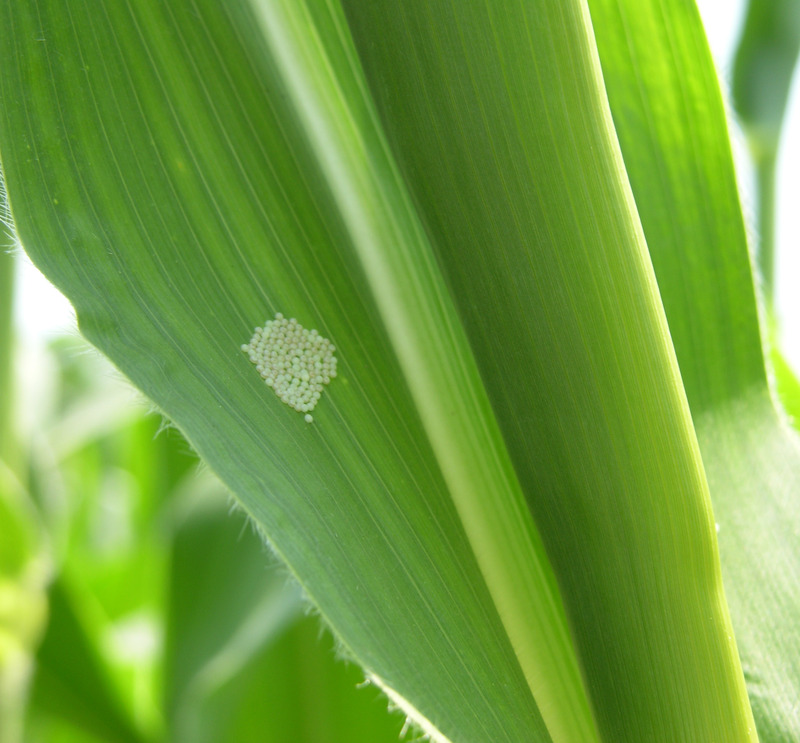 A few tweets, text messages and reports from our scouts have indicated that WBC egg masses are being found in corn this week. 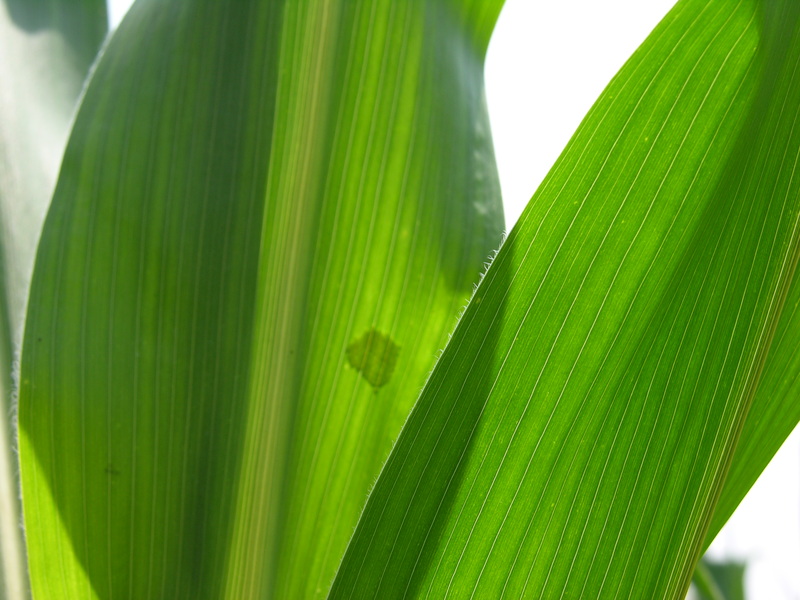 The next two to three weeks are key for scouting and managing WBC for the bulk of the corn crop. Though the typical hot spots (eg. Bothwell area) are more prone to significant populations, last year taught us that the moths can lay their eggs across much of the main corn growing region of Ontario. 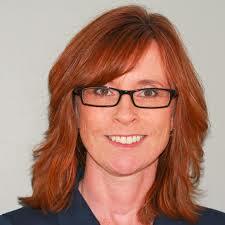 Damage was more widespread in Ontario than in previous years. 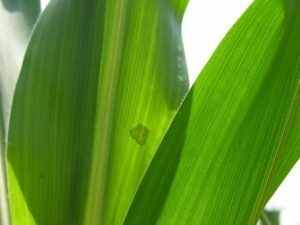 What to Look for: WBC moths lay eggs on the upper leaf surface of the upper leaves of the corn plants that are still standing upright and prefer fields in the whorl-to-pretassel stages of corn. WBC eggs are the size of a pin head, pearly white when first laid and are shaped like tiny cantaloupe. As the eggs mature, they turn tan and then purple in colour. Eggs hatch in about 5–7 days. Once the corn crop is in tassel or beyond, the moths prefer to lay their eggs on the dry bean crop or later planted corn fields still in pre-tassel stages. Peak moth flight is typically the last week of July, first week of August (starting first in the SW and then into E ON). Scouting Method: Scout fields not planted with Vip3A Bt hybrids. Inspect 20 plants in five areas of the field. Focus efforts on the top three-to-four upper leaves of the plant. Look for egg masses and young larvae. Use the sun to your advantage and look for shadows of egg masses showing through the leaves. Turn the leaves over to confirm that it is a WBC egg mass. Action Threshold: For fields not planted with Vip3A Bt hybrids, spray is warranted if 5% of the plants have egg masses or small larvae. That means 5 egg masses found on the 100 plants inspected! If the eggs have hatched, spray at 95% tassel emergence or if tassels are already emerged, when most of the eggs are expected to hatch. Spray Timing: Insecticide application is most effective when it is done close to or shortly after egg hatch. Eggs hatch one or two days after turning purple. Insecticides Registered for Western Bean Cutworm on corn are listed here. Protect Pollinators: When corn is in tassel, pollinators may be foraging in the field. Time insecticide applications to minimize bee exposure. Spraying in the evening after 8 pm when temperatures are below 13°C helps minimize honey bee exposure, unless there is evidence of a strong temperature inversion. The second best option is to spray early in the morning before 7 am. If you plan to spray, contact beekeepers who have hives within 5 km of the field so that they may take further measures to reduce risk of exposure. More information on protecting bees from foliar applications is available here.